When DeLesslin George-Warren offered guided tours of the Smithsonian Institution's National Portrait Gallery hall of presidential portraits in 2016, it wasn't to provide the comforting stories of American heroes that one might have expected. His goal was to offer a perspective on our country's history from a point of view rarely considered: that of this land's indigenous peoples. "People never think about interactions between indigenous people and presidents, other than 'Andrew Jackson was bad,'" George-Warren says. "They were all terrible [to Native Americans] in their own specific ways." A member of the Catawba nation of South Carolina, George-Warren has poured much of his energy as a creative artist into making sure that Native voices aren't silenced. Last year, he received a grant to work on a project to revive the Catawba language, the last fluent speaker of which passed away in the 1960s. In addition to helping code a mobile app to facilitate learning the language, he has worked on creating clothing and posters featuring messages in Catawba, trying to, as he puts it, "turn a dictionary back into a living language." When he visits the Utah Museum of Fine Arts this week, however, it will be to provide the same kind of unique perspective on mythologized American history that he brought to Smithsonian visitors in Washington, D.C. As a supplement to the ongoing Now West! exhibition of art showcasing the history of the American West, George-Warren will present a series of his "Indigenous Corps of Discovery" tours, framing the narrative of westward expansion through stories of indigenous dispossession. "I grew up, really, in our museum on the reservation," says George-Warren, whose aunts ran the cultural center, "so I have a deep love of museums. But I saw how completely absent Native Americans were from the storytelling. There would be images, but nothing really about our stories." George-Warren's own story is a unique one, in part informed by his queer identity. He describes growing up on Catawba land, and attending school outside the reservation. "I knew I wasn't straight from an early age, but I knew it wasn't super-acceptable," he says. "I came out during my sophomore year of college [at Vanderbilt University], so I was away from my community when I was going through this journey. Then I also discovered that I had to come out as Catawba, and it was often more fraught and annoying than coming out as queer: 'You don't look it, how much are you.' They were both, in their way, stressful processes." 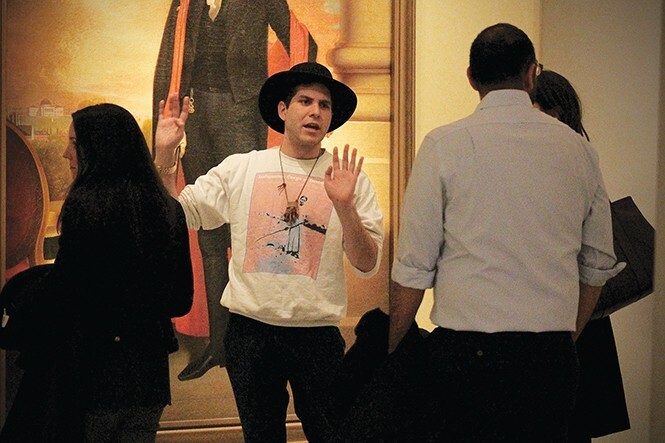 He found a unique perspective on his identity as a queer Native American during the protests at Standing Rock in 2016, where George-Warren went to deliver a letter of support from the Catawba community. There he stayed in what was called the "Two-Spirit Camp," drawing from the tradition in many indigenous cultures that revered individuals with a non-binary gender identity. "It was the first time I felt fully seen as both [queer and Native American]," he says. "Those things aren't separable from each other. You can't ask me to check just one box." George-Warren himself isn't easy to pin down—a student of operatic performance and musical composition who has become a performance artist, linguist, historian and activist. He brings that distinctive cross-section of talents to presentation like this week's scheduled event Histories, which explores ideas of whose stories are told, and why. And while the presentation takes the superficial form of a lecture—interspersed with songs and personal storytelling—that structure is part of the performance. "I was really curious about, who do we trust when they say things," George-Warren says. "What I was finding amazing is, if it's just a person in street clothes, or a person of color, there's a lot of doubt. But a person in professional clothes on stage behind a lectern, automatically a lot more trust is given to that person." George-Warren realizes that the alternative histories he presents can make some people uncomfortable, even as he emphasizes that his presentations are informed by his own background and point of view. The stories that people are familiar with are deeply ingrained, and even for a self-selecting audience of people interested in a tour of this kind, there can be resistance to hearing about the darker side of legends like George Washington and Abraham Lincoln. He even finds that some people are surprised by the fact that he isn't angrier as he relates tales of the way indigenous peoples have been treated throughout American history. Yet that, too, is some way part of his talent as a performer. "I try to put on this very positive 'tour guide' air," he says. "Being charming and welcoming to people is part of it. That disconnect was actually unsettling for a lot of people."